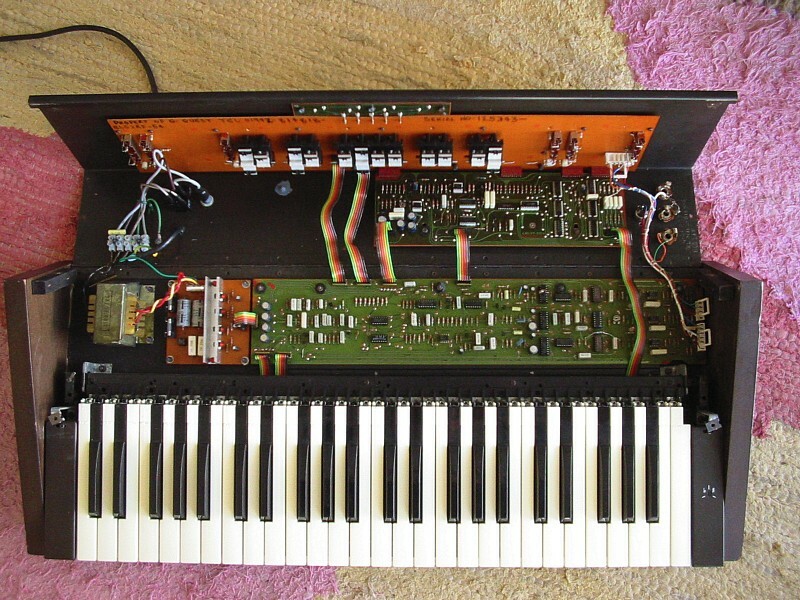 This ARP is not an ARP, but a SIEL Orchestra keyboard with some modifications. Built from 1979 to 1980 (according to Peter Forrest's books) by Siel. 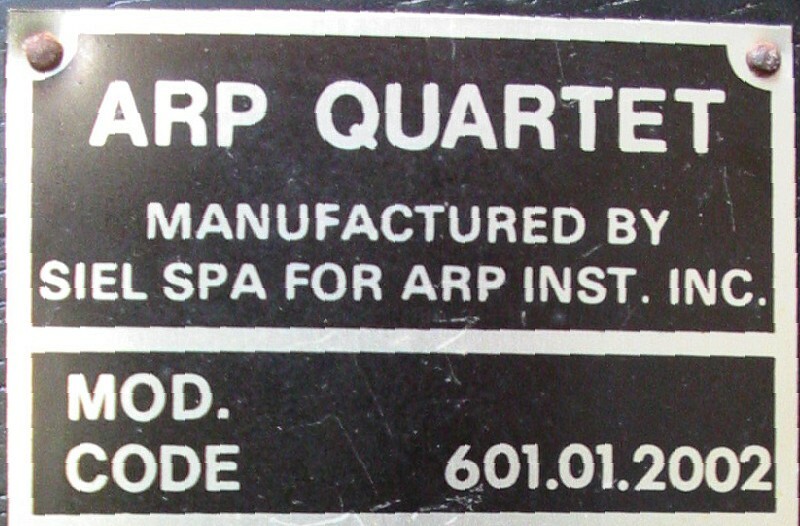 And it was clearly statet as being manufactured by Siel on the label and the back of the unit. You have four push buttons in the middle, just above the keys. Each selecting one of the sections.You may select one or more sections at a time. And each of the corrosponding switches and sliders got a LED to show you which controlls are now active for the selected part(s). These select the filter function of the paraphonic (a single filter for all voices together) and single trigger Brass section. The Vibrato Speed is ranging from a few Hertz to audio frequencies (about 20-30 Hz ?). The vibrato is always delayed. The modulation of the vibrato LFO is increasing after the pressing of a note till it reaches the max after 2 secs. This is again paraphonic. So you have to release all keys before this delay starts again. Notes pressed while other notes had been pressed before will start with the max vibrato amount. If you switch the Vibrato off, the LED above the Vibrato Speed will be switched off too. Nice. So the beginner learns how functions interact and when some sliders just won't change a thing. The Brass Sustain will switch the sustain of the Brass section to a way lower volume. Think of it as the Sustain of an ADSR being reduced from max to 50%. Nice to add some brass attacks to the strings without having a full brass section mixed with the strings. These do differ in pitch (Trombone being 1 octove below Trumpet) and waveshape. The Trumpet is more brilliant in sound. All parameters named before are active when the Brass section is active. The Cello is one octave below the Violin sound. And in the same pitch as the Trombone sound of the Brass section. Except for the octave, there is also a little difference in sound from the Cello and the Violin: the Cello is more low-pass filtered. The Percussion switch will shorten the string sounds to a short volume decaying sound of half an second. The vibrato is preset. And there is some kind of other modulation added to it. It is not as good as an ensemble FX of many other italian string keyboards. It is lacking the warmth. By swithing the Solo to on (flipping the switch to the back), the vibrato section described above will be active. This way you get a more warmer sound with a complex vibrato . The delayed vibrato of the Brass section is modulating the String section with the delayed function. And the vibrato of the String section is also active. This way you get more warm and nice strings known from other string keyboards. But because of the missing amount of the Solo vibrato, you will have a slightly over the top vibrato. All in all a usable section, but missing the warmth and charm of a Loggan String-Melody or an ELKA String like the Rhapsody 490 or 610. Both are using the same added squarewaves from different octaves to add them to a stack of a somewhat squarewave organ like sound. The Organ preset adds the lower octave for more bottom. Not impressive for todays ears. Both sounds have nothing in common with a real piano sound. The Piano preset is rather dull. While the Honky Tonk is real bright in sound. Here the instrument is featuring a full polyphonic volume envelope. Each key triggers its own little and short decaying volume envelope. The Attack is active when the String or the Organ section is active. The Sustain (actually the release time) is only active when the Piano section is active. Both have no effect to the sounds on my unit. Maybe some capacitor needs to be replaced. At the very right of the row of sliders and flipping switches is the Volume control. Of cause always active. Under the keyboard, there is a huge board generating the top octave pitch and diveds it down to the pitch of each key in each octave. And the needed octave of the selected sound. 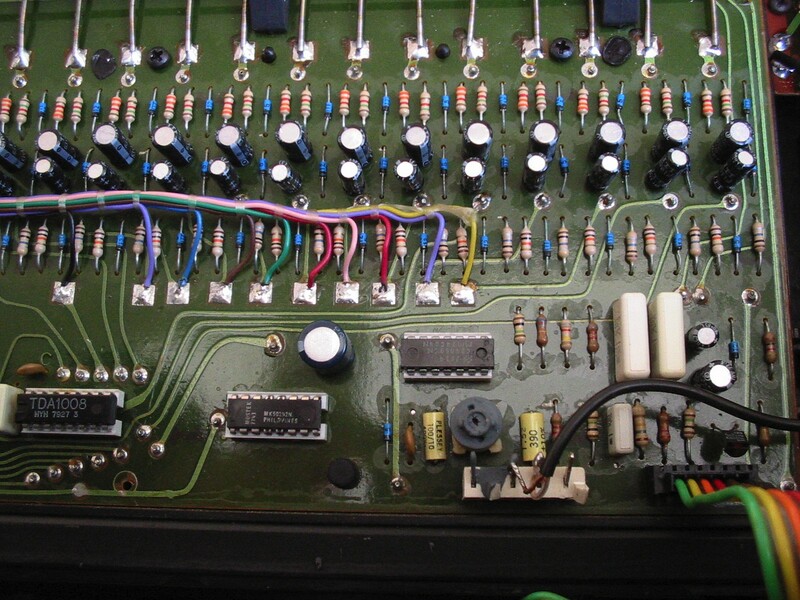 the top oscillator and the top octave divider is at the lower middle and right of this icture. The black cable is the tuning knob (at the right of the top key) going to the top oscillator. 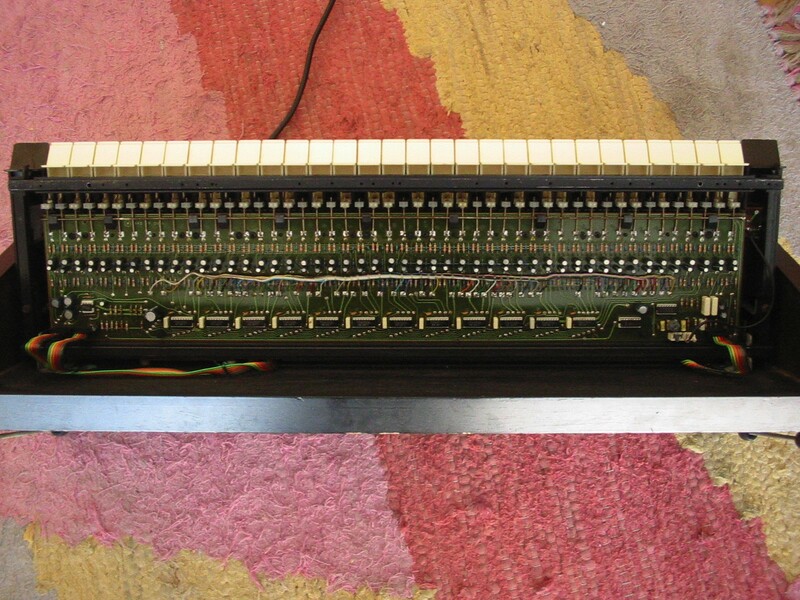 The top octave divider is a Mustek MK50242. Its the chip under the single big capacitor in the lower center of the picture. The chip on the right of this capacitor is a Fairchild MM74C04N Hex Inverter. I have no clue what it is used for here. The 12 octave dividers chips (one for each note of an octave) is a TDA1008. This chip also selects a combination of the availble different footages via a 5 channel matrix. It is also gating the simple envelopes. The power supply is easy to spot at the lower left just above the lowest keys. The power regulation is the brown board on the right of it. The next board (green) to the right and the other green board afixed to the back of the instrument is doing something on the sound. Not sure what in detail. And the little green board and the huge brown board under the user interface is holding the switches, sliders, the 12 LEDs, and the four bottons to select the different sound sections. In the back you find the attached power cable and the mains on/off switch. And of cause an output: one labeled "high", the other labeled "low". The later is for mic inputs. The higher output is for line level inputs of mixers and amps. Both of these are 1/4" (6.3 mm) sockets. There is also a Sustain pedal as 1/4" socket. The Volume pedal socket is a 5-pin DIN connector. It look slike a Midi socket. But please never connect a Midi input or output to it. It might kill this or the connected keyboard.